In an interview last week, late-term abortion star Wendy Davis (D) admitted there are some discrepancies in the chronological details of her personal history as related by both herself and her aides. This is an important issue, especially since her gubernatorial campaign has made her personal story–that of a struggling young teen mom who worked her way to Harvard Law School, then on to become a Texas state senator who became a champion for other struggling women–the central focus of her bid. However, as Breitbart News’ Joel Pollak observed, Davis was not a “teen” when she was divorced but 21-years old instead. In addition, as The Dallas Morning News reports, her second husband, Jeff Davis, paid for her final two years at Texas Christian University (she received an academic scholarship and a Pell Grant for her initial studies). “It was community resources. We paid for it together,” Davis said. The report also states that when Wendy Davis was accepted into Harvard Law School, her husband Jeff cashed in his 401(k) account and eventually took out a loan to pay for her final year there. In fact, a timeline from The Dallas Morning News shows that Davis’ husband took out a 10-year loan to pay for her Harvard law education. 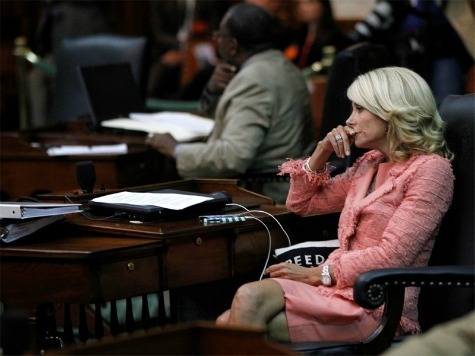 However, Wendy Davis clearly sees the story of a struggling, single young mother from a “broken home,” as PolicyMic reported last June, is her best bet to connect with young female voters.